Can developing their emotional intelligence help school administrators manage stress and lead more effectively? The New York City district is betting on it. For school leaders, stress is inevitable. The day-to-day grind of leading is emotionally demanding, and new challenges and higher accountability create a fever pitch of emotion that can churn inside even the strongest of leaders. 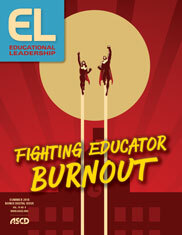 However, although stress is expected for education leaders, burnout can be optional. Moderate amounts of healthy stress triggered by efforts to achieve meaningful goals (called eustress in the research literature) can increase personal accomplishment and workplace engagement and even improve job performance (McGonigal, 2016). The problem arises when stress becomes so frequent and so overwhelming that it leaves educators physically and emotionally depleted and they no longer feel a sense of passion and personal accomplishment (Maslach, Schaufeli, & Leiter, 2001; Le Fevre, Matheny, & Kolt, 2003). When this happens, stress becomes distress, and one runs the risk of burning out. The impact of constant stressors—such as the social-emotional demands of work or a steady stream of crises that challenge one's sense of perspective—can lead to the chronic depletion of mental and physical resources or "emotional exhaustion" (Grissom & Andersen, 2012; Maslach et al., 2001). But this level of distress can be effectively navigated, or even avoided. Research suggests that principals with higher levels of self-efficacy tend to display higher levels of work engagement and job satisfaction, along with lower levels of burnout (Federici & Skaalvik, 2012). Self-efficacy is a key psychological capacity for inoculation against the high pressures of educational leadership. To understand how a leader's sense of personal accomplishment and self-efficacy can fade or grow, we have to understand the power of emotions. A recent study found that school leaders who reported greater levels of emotional exhaustion were more likely to experience a range of negative emotions, such as anxiety or anger, and were less likely to experience various positive emotions, such as hope or joy (Brackett, Floman, & Bradley, 2018). Also, emotionally exhausted leaders were less satisfied with their jobs and were more likely to want to quit the profession or retire. Not only does burnout take a toll on a leader's work, but it also has a negative impact on his or her mental and physical health. The same study found that leaders who scored higher on emotional exhaustion reported exercising less frequently, missing more work days due to stress and mental health problems, and experiencing greater sleep troubles. Researchers and educators from the Yale Center for Emotional Intelligence and Star Factor Coaching have been helping superintendents in the New York City school district strengthen their emotional intelligence by showing that emotions matter. Madeline Chaffee and Kathryn Lee teach emotional intelligence training in Brooklyn, New York. Emotional exhaustion—a by-product of chronic unhealthy stress—is not inevitable for school leaders. A major cause of distress is when leaders mismanage emotionally charged situations. This suggests that, by developing the skills of emotional intelligence (EI) (Salovey & Mayer, 1990), school leaders can prevent much workplace stress. Emotional intelligence is the ability to recognize emotions in one's self and in others, to understand the causes and effects of emotions, and to manage emotions effectively to suit a goal or situation (Mayer, Caruso, & Salovey, 2016). Leaders with developed EI possess greater self-awareness: Among other actions, they pause multiple times throughout the school day to reflect on their emotions and their meaning. Critically, emotionally intelligent leaders learn to recognize the behaviors, triggers, and events that lead to unhealthy stress. Since 2015, the New York City school district has spearheaded an unprecedented initiative to infuse EI training throughout the school system. Partnering with our organizations—Star Factor Coaching and the Yale Center for Emotional Intelligence—NYC has developed a program that includes intensive professional development training and coaching in emotional intelligence for district and school leaders. Dolores Esposito served 11 years as a superintendent before taking on her current role as an executive superintendent of leadership at the New York City Department of Education. She says the emotional intelligence training she has received helps her thrive rather than burn out in psychologically demanding positions. The skills she has learned not only help her to manage her own emotions, but they also empower her to recognize and understand others' feelings, especially those who have competing needs and require personalized support to move toward positive action. Further, Esposito now recognizes authentic listening as an essential skill that facilitates her leadership efforts and supports the needs of all school stakeholders. "Without emotional intelligence strategies and skills, it would have been much more difficult to effectively lead, inspire, and manage the complexity of the 21st century superintendent's role," Esposito says. As part of the EI development program, all New York City school leaders attend training sessions that are based on RULER, a tool developed by researchers at the Yale Center for Emotional Intelligence that provides an evidence-based approach to social–emotional learning. It teaches five key skills: recognizing, understanding, labeling, expressing, and regulating emotions (see "Focus Areas for Developing Emotional Intelligence"). From the outset, the educators learn that emotions matter in schools, especially for learning, decision making, relationships, health, and everyday performance. Using role plays, reflection, and feedback, they practice applying these skills in positive communication, conflict management, empathy, and systems thinking. To reinforce and individualize leaders' learning, the district partners with leadership coaches from our two organizations. The coaches work with individual leaders for five months to explore emotional challenges and successes. Coaches ask questions, listen, and provide resources on how leaders can develop specific skills, such as emotional regulation. These skills directly help to build resilience and support healthy interpersonal problem solving and conflict resolution. The coaching process begins with leaders reflecting on their personal and professional vision and values and setting personal and professional goals for their own development. Then, throughout the process, the leaders get intensive and thorough feedback on their leadership behaviors. The feedback helps them identify the gap between the leader they are and the leader they hope to become. Blind spots and challenge areas are identified and become the focus of leadership development goals. Examples of development goals include: listening more (and solving problems without others' input less), showing empathy to others in need, being more present and focused, empowering rather than micromanaging others, managing frustration or disappointment more effectively, and being more in tune with the emotions of those around them (rather than making assumptions). As leaders make progress toward their goals, they generally become more hopeful and confident about their leadership and what is possible for their school community. As school leaders build their leadership self-efficacy, they model their emotional intelligence skills. These leaders actively and regularly articulate their vision to the larger school community. For example, one superintendent who has undergone coaching now begins every professional development meeting with stories about her progress developing greater self-awareness and self-management. She speaks about how she now uses breathing exercises and pauses before reacting when she feels angry. This is in comparison to how she used to blurt out whatever she was thinking or feeling, sometimes to the detriment of others. Her transparency about her leadership growth inspires others to grow themselves, generating a positive contagion of personal development throughout her district. The focus on emotionally intelligent leadership in NYC public schools has fostered a systemwide effort to build a culture anchored in emotional intelligence. The leaders' training has helped to transform multiple school communities into collaborative learning environments with a shared vision, common values, and clear norms of how to develop together. With enhanced EI skills, healthy relationships thrive and supportive social networks accelerate student success. Through the ripple effects of implementing EI training in leaders, positive communication and healthy social-emotional development can spread to teachers and to students (Jennings & Greenberg, 2009). In these school communities, self-awareness and self-management skills have become the pillars of pedagogy and school culture. Educators become proactive with their emotions, which helps them to avert the array of workplace stressors that trigger burnout and turnover. This can also lead to more conscious interactions, generative relationships, and a willingness to support one another through challenging moments. In schools with this developmental focus, conflict gets put on the table instead of under it, and adults work through the hard issues instead of avoiding them. Assumptions are challenged, and differences are explored to find common ground. In schools where EI is integrated throughout, adults are equipped to work through all of the hard spots. Create an expectation that emotions matter. Emotions are a part of everyone, and all leaders can get better at how we handle stressors. Foster a culture that not only includes traditional instructional learning coaching, but also supports leaders and teachers socially andemotionally. Incorporate self-reflection practices into every professional development opportunity. Reflection exercises should explore ways to examine our thinking about our emotions and our emotional skill levels. Prioritize time in meetings to discuss school challenges and ideas with community members and receive feedback about how teachers and leaders handled difficult situations. Revisit community norms regularly to check in on how everyone is feeling about the school's climate. Emphasize self-care practices, such as meditation, yoga classes, exercise, and retreats. Allow teachers to include a self-care commitment when they set their performance goals. Encourage individuals to take short physical or mental breaks every 45–60 minutes, to focus on work that makes them feel capable and productive, and to use their time off for enjoyable activities. When given time and space for EI development, education leaders are more likely to see moderate levels of stress as a pathway toward self-efficacy and personal accomplishment. With self-awareness to detect the onset of unhealthy stress and helpful strategies to manage stress, leaders are more likely to reach out for emotional and community support, avoid burnout, reconnect with their purpose, and more passionately and skillfully cultivate flourishing schools. Recognizing and Labeling Emotions. Education leaders burn out because they don't recognize the toll of living with dysregulated emotions that can be both the cause and result of stress. Coaches encourage education leaders to be mindful of their feelings and to label them. Leaders learn to pay closer attention to their body's signals of stress, such as tension in the neck, shoulders, or stomach; hotness in their hands or face; or an accelerated pace of breathing. Understanding Emotions. Emotions can be simple or complex. School leaders are so busy tending to the emotions of others that they may not take that step back to try to understand their own emotional responses. It is just as important for the leader to understand the reasons why they may be acting indifferent, joyful, or angry. This understanding provides a doorway to modify or change a given behavior. Expressing Emotions. School leaders often tell us that they hide their emotions from those they supervise, especially when those emotions are negative or include negative perceptions of a staff or community member. Leaders often experience emotional labor, stress, or fatigue from holding back their true feelings and putting on that "happy" face. And yet having difficult conversations with teachers and staff members is an everyday occurrence for a principal. Good leaders try to set up a culture where conflict is expected. They set the tone that these conversations can be had with civility and mutual respect, thereby encouraging individual and collective growth. Regulating Emotions. With increased awareness, education leaders envision their best selves and practice strategies for managing their emotions proactively and effectively. They set short-term goals in the service of their vision that help to approach difficult situations with new EI skills. They continuously practice with the support of their coach, noticing challenges and strategizing ways to solve them. Brackett, M. A., Floman, J. L., & Bradley, C. (2018). Emotion revolution for education leaders (survey). Unpublished data. Yale University. Federici, R., & Skaalvik, E. (2012). Principal self-efficacy: Relations with burnout, job satisfaction, and motivation to quit. Social Psychology Education, 15(3), 295–320. Grissom, J. A., & Andersen, S. (2012). Why superintendents turn over. American Educational Research Journal, 49(6), 1146–1180. Jennings, P. A., & Greenberg, M. T. (2009). The prosocial classroom: Teacher social and emotional competence in relation to student and classroom outcomes. Review of Educational Research, 79(1), 491–525. Le Fevre, M., Matheny, J., & Kolt, G. S. (2003). Eustress, distress, and interpretation in occupational stress. Journal of Managerial Psychology, 18(7), 726–744. Maslach, C., Schaufeli, W. B., & Leiter, M. P. (2001). Job burnout. American Review of Psychology, 52, 397–422. Mayer, J. D., Caruso, D. R., & Salovey, P. (2016). The ability model of emotional intelligence: Principles and updates. Emotion Review, 8(4), 290–300. McGonigal, K. (2016). The upside of stress. New York: Avery. Salovey, P., & Mayer, J. D. (1990). Emotional intelligence. Imagination, Cognition and Personality, 9(3), 185–211. Janet Patti is a professor in educational leadership at Hunter College and cofounder of Star Factor Coaching, a consulting firm that partners with districts and schools to build social and emotional capacities in educators. Allison Holzer is the co-founder of the talent-strategy firm InspireCorps and the principal design, research, and strategy officer for Star Factor Coaching. Robin S. Stern is the associate director of the Yale Center for Emotional Intelligence at Yale University and co-founder of Star Factor Coaching. James Floman is a postdoctoral associate at the Yale Center for Emotional Intelligence at Yale University. Marc A. Brackett is a professor in the Child Study Center at Yale University and director of the Yale Center for Emotional Intelligence.